Northern Arch is a dive site with a steep arch with in soft and hard corals decorated walls. This is a verticle slot 37 - 44 metres deep at the shallowest point. Northern Arch is an excellent dive more suited to the advanced diver. Schools of blue maomao and trevally can be seen schooling on the surface and we often see magnificant kingfish speeding past. The archway is generally teeming with fish like pink maomao, trevally, and demoiselles around the 12 - 25m depth range. Mado and porae can often be seen deeper and sightings of some less common species such as long-finned boar fish and splendid perch are not uncommon. Flights of stingrays sometimes patrol the arch from 10m down. The wall to the north of the arch is a great place to do our safety stop with colourful sponges, anemones, moray eels, and i can generally find a crayfish in a crevice to observe. Only experienced deep divers should contemplate diving right to the bottom. Beware, outside the arch the bottom drops rapidly away past 60m. One of the top dive sites at the Poor Knights Islands is Northern Arch at the most northern tip of Tawhiti Rahi Island. From December to March you will often find short tailed stingrays near the arch's base as this is the place where they mate and breed. Other species that you can often find while diving here are red snapper, blue maomao, trevally and kingfish. 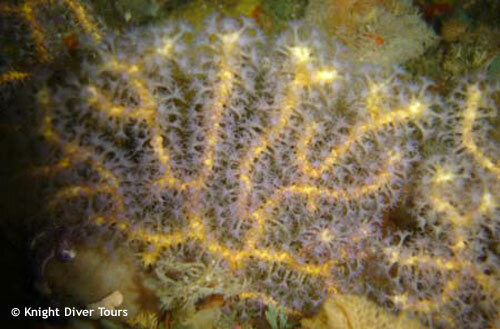 Gorgonians, sponges, anemones, nudibranches and hydroids are excellent decorators of the walls near Northern Arch. These already steep walls drop away to below sixty meter once you leave Northern Arch.